AutoNation Inc., seeking to broaden its customer base, is expanding a set of no-haggle outlet centers specializing in the sale of older-model, lower-priced used cars. Top executives of the largest U.S. auto retailer outlined the strategy today as they announced an increase in third-quarter operating profit and the addition of seven Fiat franchises awarded by Chrysler Group. The used-car centers, called Value Vehicle Outlets, are located at existing stores, though the outlet cars are segregated and marked differently. AutoNation launched a pilot at its Courtesy Ford store near Orlando during the second quarter. Six more locations are planned by next March, bringing the total to 22. The outlets stretch across all four of AutoNation's regions, with one to three sites planned per market area, depending on the population and supply of used vehicles, Maroone said. Vehicles at the outlet have an average price of less than $8,000. At one outlet location in South Florida, prices advertised online ranged from about $2,000 for a 1997 Ford Aspire to $23,000 for a 2007 Lexus RX 350. The outlet vehicles go through a thorough reconditioning, Maroone said. They are backed by a three-day, money-back guarantee and a one-year roadside assistance package. AutoNation expects incremental sales of between 50 and 60 vehicles from each outlet per month, Maroone said. Vehicle margins as a percent of revenue are higher than the typical used vehicle, he said, though the absolute dollar profit is slightly less. Separately, AutoNation said today that Chrysler has granted it seven Fiat franchises. The retailer's Fiat locations will be in California, Colorado, Arizona, Washington, Virginia and Georgia. Chrysler announced last week that it had begun awarding the franchises but didn't reveal the number or names of the retailers. AutoNation continues to talk to Chrysler about additional locations, CEO Mike Jackson said in the interview. Most but not all of the Fiat outlets will be paired with Chrysler operations, Jackson said on a conference call. The Fiat stores likely will open near the end of next year's first quarter, Maroone said. AutoNation already owns the facilities that will house the seven Fiat stores. AutoNation declined to discuss how much it is investing in Fiat or how many employees it will add at the new stores. AutoNation's $120.9 million operating profit marked a 2.5 percent increase from the third quarter of 2009 and reflected revenue gains in all areas of the business. Net income slid 12.5 percent to $56.9 million, primarily because of higher interest expense related to debt refinancing used to fund a share buyback plan. With fewer shares during the latest period, AutoNation's earnings on a per-share basis, not counting discontinued operations, rose 8 percent. Third-quarter revenues increased 13 percent to $3.3 billion. Operating highlights for the quarter came in the retailer's domestic-brand segment and in used vehicles. Sales of new domestic-brand retail units rose 15 percent, and income in the domestic segment jumped to $43 million, up from $33 million a year earlier. Ford and Chevrolet led the way, Jackson said. Unit sales in AutoNation's import segment dropped 3 percent, and income declined to $51 million from $63 million a year ago. Luxury unit sales rose 3 percent, and income in the luxury segment increased to $48 million, up from $44 million a year ago. Used-vehicle revenue increased 28 percent to $812.4 million. New-vehicle revenue rose 9.7 percent to $1.8 billion. Revenue from parts and service jumped 6 percent to $564.1 million, while net finance-and-insurance revenue climbed 18 percent to $111.9 million. • 13% growth in total third quarter revenue over the prior year, driven by 15% growth in retail vehicle revenue. • AutoNation was awarded seven Fiat franchises and will be the biggest Fiat dealer in the U.S.
•Third quarter EPS from continuing operations was $0.39, an 8% increase compared to $0.36 in the prior year, which included the highly successful Cash for Clunkers program that aided our prior year results by an estimated $0.07 per share. FORT LAUDERDALE, Fla., Oct 28, 2010 /PRNewswire via COMTEX/ -- AutoNation, Inc. (NYSE: AN), America's largest automotive retailer, today reported 2010 third quarter net income from continuing operations of $59 million, or $0.39 per share, compared to net income from continuing operations of $64 million, or $0.36 per share, for the same period in the prior year, an 8% improvement on a per-share basis. AutoNation's 2010 third quarter revenue totaled $3.3billion, compared to $2.9 billion in the year-ago period, an increase of 13%, driven primarily by stronger new and used retail vehicle revenue which increased 15%. Based on CNW Research data, in the third quarter, total U.S. industry new retail vehicle unit sales decreased 4%. AutoNation's new vehicle unit sales, on a same store basis, increased 1%. AutoNation's 2010 third quarter used retail vehicle revenue increased 31% compared to the year-ago period, as retail unit sales increased 25%. Parts and service revenue increased 6% and finance and insurance revenue increased 18% compared to the third quarter 2009. Mike Jackson, Chairman and Chief Executive Officer, said, "We delivered strong performance in the third quarter, which was driven by both new and used vehicle unit sales and revenue. We continue to expect full year industry new vehicle unit sales to be in the range of 11.5 million new units." •Domestic - Domestic segment income (1) was $43 million compared to year-ago segment income of $33 million. Third quarter Domestic retail new vehicle unit sales increased 15%. We had a solid performance from our domestic stores, especially Ford and Chevrolet. • Import - Import segment income was $51 million compared to year-ago segment income of $63 million. Third quarter Import retail new vehicle unit sales decreased 3%. • Premium Luxury - Premium Luxury segment income was $48 million compared to year-ago segment income of $44 million. Third quarter Premium Luxury retail new vehicle unit sales increased 3%. (1) Segment income is defined as operating income less floorplan interest expense. AutoNation also announced that it was awarded seven Fiat franchises and will be the biggest Fiat dealer in the U.S. with locations in California, Colorado, Arizona, Washington State, Virginia and Georgia. For the nine-month period ended September 30, 2010, the Company reported adjusted net income from continuing operations of $179 million or $1.11 per share compared to $154 million or $0.87 per share for the same period in the prior year. Adjusted net income from continuing operations excludes debt refinancing costs of $12 million after-tax, or $0.07 per share, for the nine-month period ended September 30, 2010, and a net benefit of $17 million after-tax, or $0.10 per share, primarily related to a net gain on asset sales and a gain on senior note repurchases, for the prior year period. On a GAAP basis, net income from continuing operations for the nine-month period ended September 30, 2010 was $167 million or $1.04 per share compared to $171 million or $0.96 per share for the prior year period. The Company's revenue for the nine-month period ended September 30, 2010 totaled $9.2 billion, up 17% compared to $7.9 billion in the prior year. -- 13% growth in total third quarter revenue over the prior year, driven by 15% growth in retail vehicle revenue. 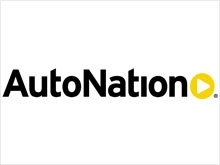 -- AutoNation was awarded seven Fiat franchises and will be the biggest Fiat dealer in the U.S.
-- Third quarter EPS from continuing operations was $0.39, an 8% increase compared to $0.36 in the prior year, which included the highly successful Cash for Clunkers program that aided our prior year results by an estimated $0.07 per share.